This section of the Palmetto Trail borders the Poinsett Watershed used by the City of Greenville, and roughly follows the North/South Carolina state line. Enjoy a delightful forest hike that winds among the Saluda Mountains as you’re passing through one of the most significant wilderness areas in South Carolina. 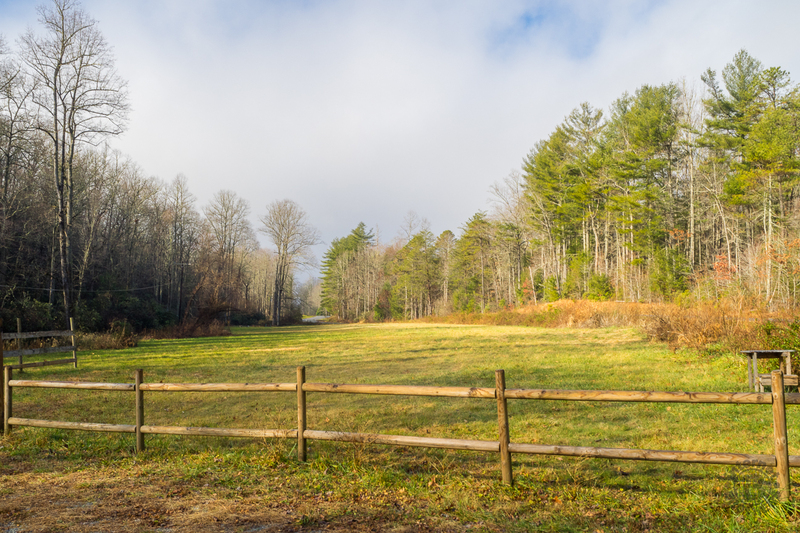 In 1993, the Greenville Water System conveyed an easement on the property to The Nature Conservancy, forever protecting the wilderness from development. The South Carolina Upstate passages of the Palmetto Trail haven’t yet received much publicity, so you’re likely to have the Saluda Mountains Passage all to yourself. We took this section of the Palmetto Trail on Tuesday, December 16, 2014 between 11:00AM and 2:45PM. The plan was to do a shuttle hike, leaving one vehicle at Talisman Camp on the southwestern end of the passage, and the other where the trail crosses Saluda Road (Old Hwy 25) on the state line. Hike Rating: Moderate. Some climbing, though not excessive. Trail Condition: Very good. Easy to follow and well-maintained. Starting Point: Just past Talisman Camp on Anders Road. Trail Traffic: No other hikers, but we did chat with a nearby resident. How to Get There: From Saluda, NC take Mountain Page Road to Saluda Road. Continue on Saluda Road south and leave a vehicle at the state line where the trail crosses the road. There is room for about 3 cars. Take the other vehicle to the t-stop and turn right on Old Hwy 25 and proceed 2.2 miles to Gap Creek Road. Turn left for 0.2 mile past Talisman Camp, continue straight on Anders Road for 0.1. The parking is on the left. There is parking for a dozen cars. The drive from Saluda to the state line along Saluda Road is quite scenic. It passes into the Green River Gorge, and follows picturesque creeks and streams while it twists and turns through dense hardwoods that no doubt light up the Autumn season. This time of year, however, all the leaves are down, leaving a stark forest, but also the ability to see what is in there. We left Griztrax’s vehicle at the eastern trailhead, and continued in my car west toward Talisman Camp. It was great to be out with Dave again, and with Grace the Wonder Dawg. He grew up in this territory, but it was new to me. I had to pay close attention to all the turns we made because I would be driving back home on my own at the end of the day. The camp itself is on Gap Creek Road, while the parking area is a tenth of a mile farther on Anders Road. A large parking lot awaits, with room for at least a dozen cars. The builders of the Palmetto Trail must be expecting this stretch to be popular in the future. At least they’re prepared. To get to the trailhead, you walk back up the road past the camp, to the junction with Saluda Road. The trailhead is right there on the corner, with plenty of markings. So too is a state line sign. While the Palmetto Trail is officially a South Carolina Mountains to Sea route, this Saluda Mountains Passage hugs the border and crosses into North Carolina several times. Talisman Programs provide exceptional summer camp opportunities for young people ages 6-22 with Autism Spectrum Disorders, ADHD and other learning differences. Talisman Camp has been offering unique alternatives to ordinary summer camps, providing a structured, nurturing environment within an exciting adventure program in a beautiful rural setting. The first mile heads mostly north, deep into the quiet woods. The trail passes along the border of, and even through Greenville’s Poinsett Watershed. The watershed provides drinking water to nearly a half-million people in Upstate SC, so you will notice warnings all along the route. For the city to originally agree to this trail, they made rules. As long as you abide, you will be fine, as will the watershed. The trail also parallels some residences and farms, like the one in the picture at the top of this post. So stay on the trail… don’t stray onto private property. About a mile in, the trail dips into Saluda Gap, then back up again over the course of the next two miles, reaching its highest point of 2,765 feet. Dave and I commented to each other several times how nice the trail is. The builders and the maintainers are to be commended. A few folks got a bit carried away with cairn building, but otherwise this is a joy to hike. The yellow blaze marks of the Palmetto Trail are always in evidence, so the cairns are somewhat redundant. You’re pretty much following the state line, with Henderson County, NC to your north and Greenville County, SC to the south. You will notice the occasional survey marker as you cross back and forth between the states. Four miles in there are more houses to your left and Bell Mountain Road comes up to the trail. There was a nice resident out working on his tractor who stopped to chat with us for awhile, telling us stories of the origins of the trail. He had been here for 40 years and was delighted to see the Palmetto Trail routed right along his property. First designed in 1994 by the Palmetto Conservation Foundation (PCF) as the organization’s signature project, the Palmetto Trail was to become one of 16 cross-state trails in the country. It would stretch from the mountains to the sea, march through cities, historic towns and a military base, and wind through marshes and along old railroad trusses. It was supposed to take a decade to build. Then administrations changed, a recession hit, funding dried up, focus turned elsewhere. Now two decades later, the trail is incomplete, and yet there’s renewed interest by the PCF and business partners to finish the trail as it was designed to be. The mountainous passages in the Upstate are the recipients of this recent renewed vigor. OK botanists out there. 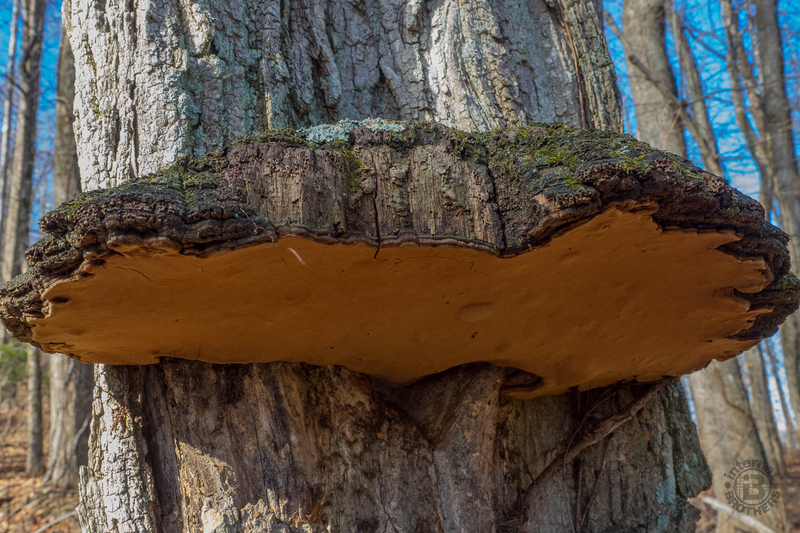 Is the large growth on the tree a burl, or is it a very large hoof conk fungus? If you know, please share in the comments at the bottom of the post. Whatever it is, we were fascinated, and stared for several minutes. Bell Mountain Road joins a dirt road that becomes the pathway for the next half mile. This is one of the stretches that hasn’t been completed yet, so the Palmetto Trail designers use rural roads or old logging road beds for passage. Where the trail again leaves the road and turns back into a single track, it also takes a decidedly southern turn and begins a significant descent. Over the next mile there are two sets of switchbacks and stairs that help you navigate the 400 foot drop. The stones used on some of the stairs came from the foundations of old 19th century homesteads in this area. Before we knew it we were out of the woods on Saluda Road and back at Dave’s car. All in all, a thoroughly enjoyable seven miles through the Poinsett Watershed. I only recently became aware of the Palmetto Trail, and this was the 2nd passage I hiked in back to back weeks. The first was at the far western end at Oconee State Park. I intend to explore the Palmetto Trail further, and if the first two sections I’ve tried are any indication, it should be filled with exciting discoveries, picturesque scenery, and great fun.